From Solvaderm comes this anti-wrinkle cream that utilizes apple stem cells, an ingredient that is fast becoming a key ingredient in today’s best anti-wrinkle creams. Apple stem cells help mature and aging skin recover from deep creases and other signs of damage by patching up creases, stimulating collagen production, and strengthening collagen fibers to delay degradation. The addition of peptides packs in an even greater wrinkle-correcting power that will have you looking better than when you were 20 in just a few weeks. 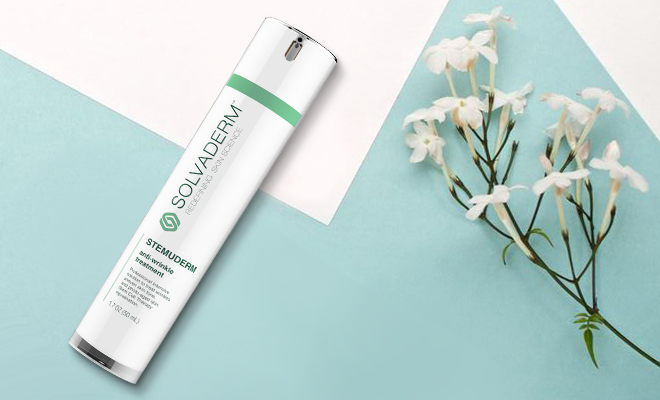 Stemuderm Customer Review: User reviews reveal that Stemuderm is effective in smoothening out and softening the appearance of wrinkles and fine lines from age 30 and up. There are no reported side effects, not even severe allergic reaction experienced from product use. Characteristically Strivectin, this wrinkle correcting cream builds its formula around the proprietary ingredient, NIA-114. This product’s key functionality that fights skin aging rests in rebuilding and strengthening your skin’s protective barrier. This mechanism is essential for older people who have thinner skin. Strivectine Customer Review: User reviews show that while many people are happy with the noticeable results, almost half of the reviews also reflect sentiments from users who are not quite completely satisfied with this product. Among those who are satisfied still think that their skin still benefited from this product in some way. Consistently named as one of the top 10 anti wrinkle creams, Olay pioneered anti-aging skincare in 1949. This particular line of Olay products boast of its high Niacinamide concentration. This particular Vitamin delivers antioxidant protection, improves local circulation, and cancels out hyper pigmentation to make your skin glow with health. Olay Regenerist Customer Review: Users have mostly positive things to say about this product. However, results appear to be modest at most, and older users are able to share that sentiment. Using Olay Regenerist, for many, is a regimen that have been passed down to them by their mothers and grandmothers. Peptides are skin boosters made up of small chains of amino acids which can function in several ways. Peptides can inhibit or stimulate certain mechanisms that determine how fast your skin recovers from damage or, how fast it becomes degraded. This product invests on peptides that speeds up your skin’s regeneration and turnover rates. It also includes the peptide, argireline, which uplifts and stretches wrinkled skin by releasing the tension that wrinkles facial muscles underneath. Oxytokin Customer Review: People who have minor to moderate wrinkle depth and are generally younger expressed satisfaction over this product’s performance. Those who have more prominent and deeper wrinkles, however, are not as happy with this product. Considered by many as the best night cream, LifeCell boasts of a broad celebrity following. It’s wrinkle-repairing formula is top-billed by Dermaxyl and DMAE (Deanol), both ingredients work together to correct skin imperfections that cause your skin to appear prematurely aged by tightening sagging skin and promoting a brighter skin tone. Customer Review: Many users commend this product for bestowing radiance back to their aged skin. A considerable number, however, expressed dissatisfaction over this product’s ability to smoothen out wrinkles and soften the appearance of fine lines. This anti-wrinkle cream relies on naturally derived ingredients to beat visible signs of aging skin. Key ingredients include hydrolyzed elastin, aloe vera, apricot kernel oil, rosemary extract, and green tea extract. Combined, these ingredients help your skin become restored and rejuvenated sooner. Bioxelan Customer Review: Users generally consider this product a good value for money. Other than extremely plumping skin to make it appear fuller and less wrinkled — temporarily — however, there is no indication that regular use redounds to longer lasting improvements in the visible appearance of aging skin. Description: If dull skin is giving you a hard time looking younger, this product will help you tackle that problem with the help of arbutin. Along with grapefruit seed extract and Vitamin C, arbutin delivers a strong astringent quality that has the power to make your skin glow with health. Perlelux Customer Review: User reviews praise this product for giving them a lighter skin tone. However, many users also recognize the fairly limited capability of this cream to correct deep wrinkles and smoothen out fine lines. Price: About €5.95 and €147.95 for a kit. Free trial available. Matrixyl 3000 and argireline are at the center of this anti-wrinkle cream formulation. Matrixyl 3000 is well-known for plumping up skin by delivering peptides that stimulate higher volumes and faster rates of collagen production. With the combination of argireline, skin stretches back to its unwrinkled state by relaxing tense facial muscles underneath. Dermology Customer Review: User reviews demonstrate that different people respond differently to this product’s formula in different ways. Some people also experienced irritations which was easily corrected by working in the product gradually over several weeks. This product boosts your skin’s natural wrinkle-fighting mechanisms by delivering the proprietary ingredient, SYN-COLL. It corrects sun-damaged skin while also protecting your skin from further damage and rapid degradation. With the addition of vitamins and highly moisturizing ingredients, this product’s primary mechanism for fighting wrinkles is by strengthening your skin and keeping it well-hydrated. Kollagen Customer Review: Some users consider this the best anti aging cream that they have ever tried. Upon closer examination, however, those are happy with this product’s performance are between 30 and 40 years old, a period where signs of skin aging are only beginning to show. Those who are 40 and beyond are the ones who said that they are not happy with this product. Creams that use these ingredients as the central component are designed to deliver wrinkling correcting function that benefits older or prematurely aging skin. There are too many anti-wrinkle products that use Vitamin A and its derivatives as key corrective ingredients to smoothen wrinkles and fade dark spots. Vitamin A tends to thin out your skin so you should avoid use if you are younger than 40 years old. Best for all ages, antioxidants serve mostly a protective and revitalizing function. It’s perfect for any skin type whether or not signs of skin aging are evident. Like antioxidants, skin of the old and young alike need to be spoiled with these two ingredients. Aging skin becomes more susceptible to internal and environmental causes of damage. Antioxidant protect your skin down to the cellular level and helps maintain the integrity of your skin matrix. You need the power of anti-inflammatory ingredients to stop and reverse the damage. Aging often begins with inflammation, a condition characterized by irritation, swelling, redness, flaking, sunburn and other effects of sun damage. To achieve younger-looking skin, you need to address this limitation. Ingredients such as alpha and poly hydroxy acids can stimulate faster collagen production on a more regular basis when infused in your wrinkle creams. Many skin mechanisms become inefficient with the passing of time, that includes the formation of pigments which can cause uneven skin tone and dark spots. Anti Wrinkle creams that flood your skin with skin lightening ingredients will help you address that. Mature skin is characterized by skin that poorly absorbs moisture and could not hold hydration. Wrinkle creams are often formulated with highly moisturizing oils and hyaluronic acid to help you address these issues. How Do The Best Wrinkle Creams Help Reduce Wrinkles? The sun is the top cause of skin aging. The best wrinkle cream will try to prevent and offset sun damage with the help of antioxidants mostly, but also with the support of ingredients that have sun blocking properties such as green tea and milk thistle. Your skin’s matrix becomes weaker and sustains more damage as it becomes weaker and more brittle. You need ingredients that help protect its integrity. Peptides can help so do ingredients like Co-Enzyme Q10 which conditions your skin matrix to lessen its vulnerability to become damaged. The top anti aging creams will deliver mechanisms that help stimulate higher production of skin precursors like collagen and elastin, but also help protect skin fibers from becoming degraded too soon.